Fires often cause a great deal of stress to anyone and not to mention soot damage to home contents, walls, ceilings and carpets. Most people do not know what to do or where to start. But lucky for you, the team at Chem-Dry QuickDry do! What Happens to a Property Affected by Fire or Smoke Damage? The heat and fire damage can release millions of soot particles throughout the home This can affect every bit of your house and because the micro size of soot is very small, may appear as a fine dust. In more severe cases the soot is much more obvious. The soot will in many cases be a health hazard. Burning a combination of materials and chemicals will be composed of carbon, produced by incomplete combustion of plastics, food, coal, oil, wood, or other fuels. Removing the smoke smell from properties can be complicated and may require forensic soot removal, air filtering, comprehensive washing of structure plus contents as well as putting odour neutralisers in place. Improve air quality with the installation of Hepa Airfilters. Smoke damage cleaning does not have to be a long and stressful process. Our team offer this service so you can focus on other important aspects when dealing with the trauma of fire emergencies. Have a look at what a test cleaning result will look like. Fire Damage Cleanups are quite often more complicated, The building material (ceilings and walls may be permanently damaged. Our disposal service will remove and dispose of building materials, fittings and any contents that cannot be cleaned or restored. 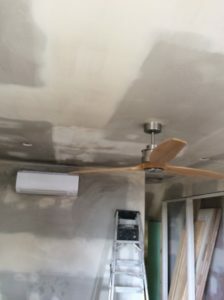 We know what it takes to fix these situations so if you hire us you can trust that your home and business is in safe hands as we know exactly what needs to be done when dealing with a smoke damage cleanup. For an affordable and reliable service, contact Chem-Dry QuickDry (the Franchisee winners of 2010) now!